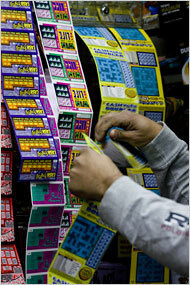 Tough times have fallen on all of us, however, lottery ticket sales are up. Never give up and hopefully one day you’ll hit that big lottery jackpot too. Here’s a story about cutting back but not on Lottery Tickets! 🙂 Here’s another story reported by the NY Times. When gasoline prices shot up this year, Peggy Seemann thought about saving the $10 she spends weekly on lottery tickets. But the prospect that the $10 could become $100 million or more was too appealing. So rather than stop buying Mega Millions tickets, Ms. Seemann, 50, who lives in suburban Chicago and works in advertising sales for a financial Web site, saved money instead by packing her lunch a few days a week, keeping alive her dreams of hitting a jackpot and retiring as a multimillionaire. Many state lotteries across the country are experiencing record sales, driven in part by intense marketing but also by people like Ms. Seemann who are trying to turn a lottery ticket into a ticket out of hard times. “I was surprised, because I thought with gas prices up and people not leaving the pump to go into the stores, we’d see a greater impact” on the downside, said Jodie Winnett, acting superintendent of the Illinois Lottery, whose sales increased 3 percent in the last fiscal year and are doing even better this year. Others are not at all surprised. John Mikesell, a professor of public finance and policy analysis at Indiana University, published a study in 1994 showing that from 1983 to 1991, lottery sales tended to rise with unemployment rates. Among their new offerings are $20 and $50 scratch-off tickets that provide higher payouts, as well as additional fast-paced electronic games, part of the goal being to draw players who might otherwise head to a casino. Indeed, New York State’s 10 percent increase in lottery sales in the last fiscal year was due largely to the introduction of more video lottery terminals. In Massachusetts, where the per-capita sales volume last year was $707, the highest in the country, officials rolled out a $20 instant-win ticket in September, partly in hopes of appealing to gamblers who might be tempted to go to one of the two casinos in neighboring Connecticut. It seems to have worked. Thanks in part to the introduction of the ticket, the Massachusetts Lottery achieved a record $4.7 billion in sales for the 12 months ended June 30, compared with $4.4 billion for the year before, and sales have continued to rise in the two months since the end of the fiscal year. No one can know, of course, whether that reversal will be fully realized. But a survey of regular players by Independent Lottery Research, a consulting firm based in Chicago, found last month that 20 percent of them were already playing less or buying less expensive tickets. So lottery directors are girding for the possibility of their own hard times, and that means staying innovative. To keep players buying, Buddy W. Roogow, director of the Maryland Lottery, is partnering with sports teams — a winning player may get tickets to a home-team game, for instance, rather than cash — and has introduced a simulated-racetrack game. “We have a challenge ahead of us,” Mr. Roogow said. For now, anyway, Sheyda Belli, 38, a human resources director in Aliquippa, Pa., continues playing the lottery, though she and her husband tightened their belts by canceling their summer vacation and cutting back on all manner of other expenses, including cable television and eating out. The other day Lou Mott, who owns a convenience store in Aliquippa, a town that has struggled since its steel mills closed in the 1980s, sold tickets to about 40 people in the 45 minutes before the state lottery numbers were broadcast. Most spent $10 or more each. Though Mr. Mott shakes his head in bewilderment at some of his repeat customers, including one retired woman who spends up to several hundred dollars a day on scratch-off tickets, he understands the motivation. “I guess everyone is looking for a rainbow,” he said.